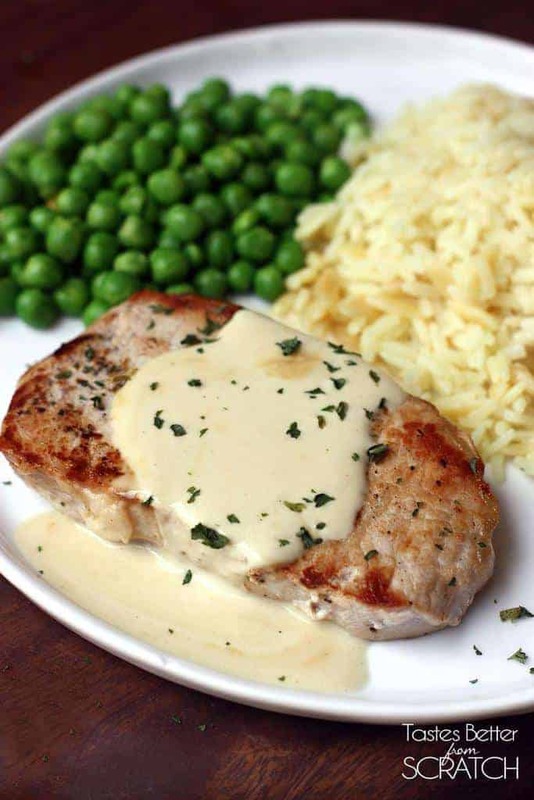 Pan-seared pork chops with a smooth, creamy mustard sauce. An easy dinner that takes just 15-minutes to make! 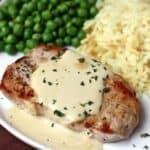 I just realized I’ve posted about a thousand chicken recipes lately, and it was high time I shared a dinner idea with another favorite meat: pork! Life is about to get crazier with school starting, sports, and holidays. We’re approaching my favorite time of year! So it’s my goal to share as many easy and fast dinner ideas with you all as I can to make your weeknights a little less crazy. Pork is so easy to cook and makes a nice change. This recipe comes from one of my favorite cookbooks for quick dinner ideas: Cooking Light Cookbook. 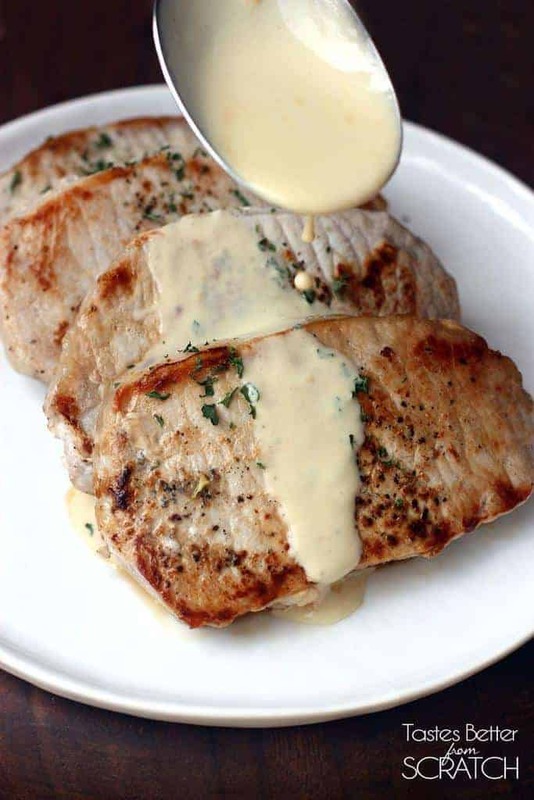 You pan-sear the pork, and then make a simple creamy mustard sauce that is spooned on top. It takes less than 15 minutes to make and it’s completely delicious! The mustard sauce is mild–my two year old loves it! This is a really simple and yummy dinner your family is going to love! Heat a large skillet over medium-high heat and spray with nonstick cooking spray. Add pork chops and cook for 2-4 minutes on each side, until browned and just barely cooked through (don't overcook or they will be tough). Transfer pork to a plate and cover with aluminum foil. Add chicken broth to the skillet and scrape up any remaining browned bits from the pork. Add cream or half & half, dijon mustard, and lemon juice. Stir well, reduce heat to medium and simmer, uncovered for 5-6 minutes or until sauce has slightly thickened. Spoon sauce over pork. Garnish with parsley, if desired. This is a wonderful recipe. I sauteed some mushrooms in butter, garlic and salt and added them on top. Delicious!!! Love that idea! Sounds delicious. Made it, turned out perfect. Will definitely make again. Quick, easy, and mostof all delicious. I made California blend veggies, and long grain wild rice. Both tasted great with the sauce also. Sounds perfect with veggies and wild rice. Delicious! Thanks for sharing, Holly.